I still have the basement-blues after recent water woes. So before launching into my Blog-Hop news, I’ll share a photo of an upstairs room: as far from the basement as I can get! This room used to be one of Bob’s store rooms. My goal in painting and decorating it was to use things I already have. Some things are from family, and some are flea-market finds from past years that I had packed away. 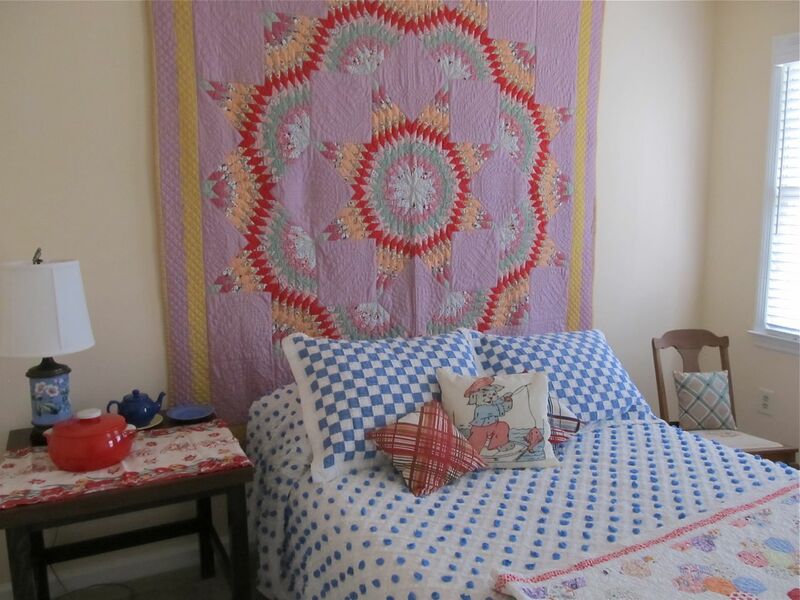 A cleaned-up spare bedroom with a vintage quilt as a wall hanging. Now for the Blog-Hop news. Thank you to Pip Marks at Sustainability Soapbox for tagging me in a blog hop in which I’m asked to answer four questions about writing. Pip’s carefully researched posts fill us in on social and environmental issues. Her topics always pique my interest, and, being on the opposite side of the world from me, bring up issues and topics I would never have known about, like … “Using Wombats to Promote Your Blog” for example. Here are my answers to the four “why we write” questions. I’m working up some additional chapters for my memoir about coping with grief after Bob’s death. An editor at a recent writing conference gave me a positive critique on my work, but also told me it was too short. Bob, my late partner, weathered two cancer diagnoses and many treatments, ultimately losing his life to a complication after he was cancer free. Losing people we love is a searing and unforgettable experience that we all have to face sometime. The more we can share our experiences, the greater the possibility for comfort and connection. Memoir about grief isn’t usually funny, but he was such an entertaining and eccentric person that it’s impossible to write about knowing him without a big dose of humor. I’m writing memoir, so I’m mining my experiences clearing out this house full of Bob’s stuff. OK, my stuff too. 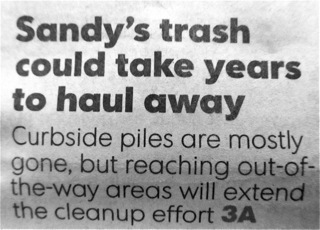 As one good example… there’s that basement I’m always complaining about. Having a leak in my grimy basement full of boxes may be horrible, but I’ll bet it’ll be entertaining before I’m through. Now all I need is a photo of me in my hazmat suit setting out to clean it up. Sheila, at A Steward’s Heart writes about simple living and a missionary life in Italy. Be sure to check out those header photos on her blog — they’re views from her home. Next is Christine at Red Pin Adventures. The red pins are points on the map, the places that she and her family live, and the points they travel to. After writing from her recent digs in Norway, this expat adventurer is moving again. I look forward to reading their Blog Hop posts in the next few weeks. Please check back to see what they have to say. Now, one last thing about that photo challenge. If you can stand it… here’s a “before” shot of that room. Spare room “before” — when it was a storage room. More on the Weekly Photo Challenge: Room. This entry was posted in Clutter Control, Downsizing, grief, Simple Living, Writing and tagged postaday, Weekly Photo Challenge. Bookmark the permalink. You have made this room look so inviting. I’m awake at 1.45am for various reasons, one being my 13yo son coughing and sneezing with hayfever. I’ve managed to help him out with a clean hankie, a glass of water and some menthol vapour rub on his chest. Back to bed and restless, your room is beautifully soothing to look at. Beautiful ‘new’ room! Your before picture encourages me to continue my personal journey, which is a struggle. Yep – the email recipients got the early version of your post; so glad I decided to hop over to read the comments. Regarding humor and grief – it sounds odd but for many people it truly does help. If you read any of Darcie Sims’ writings, she uses a liberal dose of humor to help grievers. The first grief book I read after the death of my son was “Why Are The Casseroles Always Tuna”… where Darcie wrote of the many casseroles brought after a death but were overwhelmingly tuna. Aha! It did seem to end rather abruptly! Wow, the before picture really emphasises how much you had to do. In fact, that’s pretty much what our attic looks like right now. Looking forward to popping in to the other blogs mentioned here. Nice post, Sandy! This post touches so many layers and I’m really glad to have found you. Love the before and after photos but more than anything, your honesty! Good on you, is all I can say. It’s so, so effective at many levels. Sometimes I think this is my therapy — thanks for reading! I used to have a spare bedroom very like the ‘before’ shot. When my home was broken into a couple of years ago, my neighbour came over and exclaimed ‘Wow. 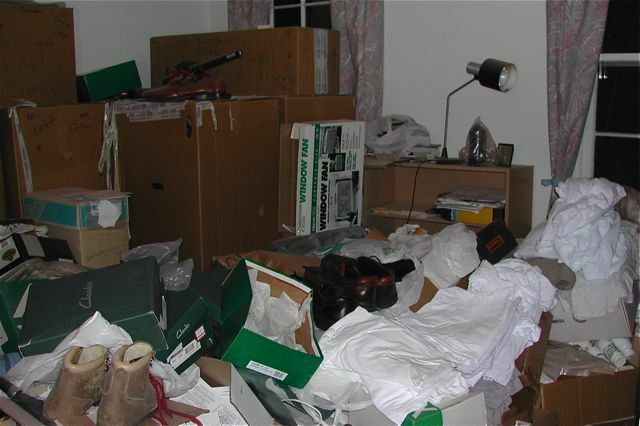 They made a real mess in this room!’ – to which I replied ‘Oh no, I don’t think they came in here’. I guess I should have been embarrassed but at least it put the thieves off! Your ‘after’ shot looks so welcoming that they might lie down & have a rest! You have no idea how glad I am to hear that you had a storage room too. I remember Bob telling me about a break-in at his apartment in Kansas City years ago. He told me the first thing the police said was “they’ve ransacked the place” but he didn’t think they did more than break the lock. Wow, what a great job on that spare room–it makes us all want to come and visit! So warm, gracious, and inviting. Thanks Sandy, for including me on the blog hop; I’ll work on the post in the next couple days. I’m especially enjoying the opportunity I hope it gives me to meet more wonderful fellow bloggers–we’ve got such a marvelous kaledeiscope community here! I changed to a theme without header photos, but put a slideshow of our area in the right sidebar–so people are warmly welcomed to visit Abruzzo–and while enjoying an espresso, or some Monte Pulciano wine! Come on over! I hope I won’t be late with the blog hop. I probably should have invited people as soon as I agreed to do it. But I didn’t think of that, and am only just now getting to it. I’m new to this hopping! Hope you’ve seen the last of leaks! Don’t worry about hurrying, it’s not about pressure, just about communicating and enjoying the moment. And just the act of finding other bloggers to pass it on to helps us build more connections. And oh yes, here’s to the last of the leaks! Oh good, I was worried I was going to mess things up! Thanks for the encouragement, and keep your wonderful posts coming! I love that you posted the before and after picture. Your new room is so beautiful. Congratulations!